Wally Evance, left, of Norway and Elmer Everson of Marquette have been friends since training camp. They were stationed together in the Pacific and are making the trip to Washington D.C. with the U.P. Honor Flight. http://upperpeninsula.biz/wp-content/uploads/2013/09/9-18-Evance-Everson.mp3Listen to the interview with World War II veterans Wally Evance and Elmer Everson. ESCANABA – Two former Seebees from the U.P. are looking forward to the U.P. Honor Flight trip. 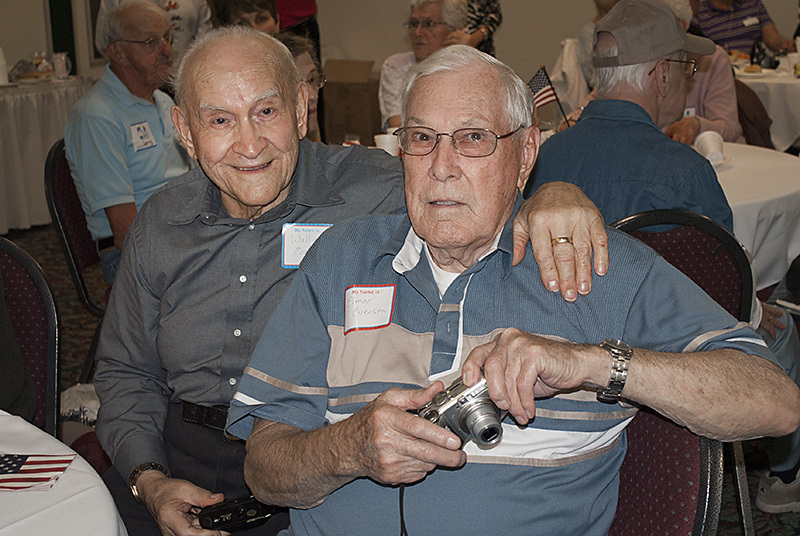 Wally Evance of Norway and Elmer Everson of Marquette have been friends since they met at basic training. They served together in the Pacific and will be sitting together on the flight Wednesday to Washington D.C.
Everson says the trip means a lot to him. Everson said it took a long time before the World War II Memorial was built. Evance said he is looking forward to seeing it. Evance and Emerson are two of 76 WWII veterans that are part of the fifth Upper Peninsula Honor Flight that is leaving early Wednesday for Washington. Evance has not seen the World War II Memorial and is anxious to see the part dedicated to the Pacific theater where he and Emerson served. Share the post "Life-long friends visit World War II Memorial together"